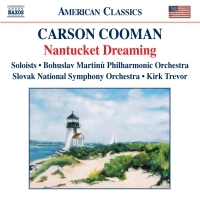 is a CD of classical music compositions explicitly inspired by the landscapes and landmarks of Nantucket Island, Massachusetts. Spanning a seven-year creative period, these diverse works, with their blazes of instrumental color, subtle atmospherics and lyrical evocations of wind, sky, land, and sea, create an interconnected narrative of shared musical images and ideas. Fanfare Magazine proclaimed that “Cooman has something to say, an engaging voice to do so, and real musical chops,” a testament to the talent of one of the most active American composers of his generation. © 2010 Carson Cooman. Paintings by Loretta Yoder. Design by Karl Hinze. Association Museum Shop, 11 Broad Street. Also available on the Albany label is a recording of The Revelations of Divine Love (Metaphors from Sea and Sky). This hour-long oratorio for soloists, chorus, and orchestra combines visions from the writings of the Medieval mystic Julian of Norwich with specific landscapes from Nantucket Island. Purchase from Amazon.com or Albany Records. Or download digitally from the iTunes Music Store.